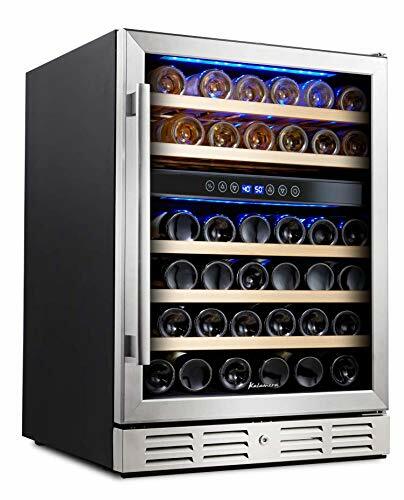 Capacity and design: This Kalamera 46-bottle wine cooler has a modern design of stainless steel and black body, with an impressive triple layer tempered glass door – an excellent insulation feature to keep cooling temperature constant. This Kalamera is a beautiful and quiet compressor-base unit. You get the advantage of powerful and consistent cooling temperature, with a low-noise and low-vibration technology by Kalamera. You can install this Kalamera 24-inch-wide 46-bottle wine cooler as a built-in, under-counter, or free-standing unit. This unit has a reversible door. Yes, you can configure the door to open to the right or left – by simply change the hinge from one side to another. 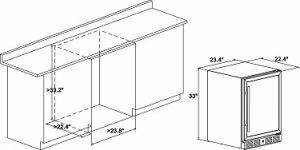 Wooden shelving: This Kalamera has five sliding beech wooden shelves. You can store eight bottles on each shelf. To get a total of 46 bottles – forty bottles on five shelves, plus six more bottles at the bottom of the unit. Did you know that beech wood slats are used in the fermentation tanks for Budweiser beer? Of course, those beech wood slats are washed and treated first. The treated beech wood slats are placed at the bottom of the fermentation tank – so the yeast has enough surface to settle (not piling up). Dual temperature zones: The Kalamera 46-bottle has a dual zone cooling system; temperature range: 40°-50°F in the upper zone, 50°-66°F in the lower zone. 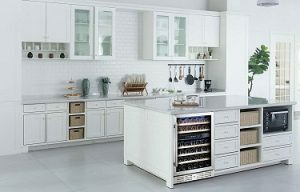 This temperature range can accommodate storing both red and white wines. In general, store your white within a range of 40°-50°F, your red wine within a range of 55°-65°F. LCD Digital temperature control: This 24-inch-wide Kalamera features a LCD temperature display with touch controls. This convenient feature allows you to monitor and easily set the preferred temperature for your wine collection. Notable feature: This Kalamera 46-bottle has a temperature memory function. You will appreciate this feature when you run into a power outage. This unit will restore the set temperature in the cooler when you have your power back on. Your wine collection will appreciate the restore of set temperature – as you have already known, vintages do not like fluctuation of temperature. LED light: This Kalamera 46-bottle unit comes with a soft-lit blue LED light. A beautiful lighting feature to illuminate your vintage collection. Security lock: This Kalamera unit has a built-in universal hexagon-bolt lock. This safety feature will prevent your young kids opening your wine cooler. This feature helps to minimize temperature fluctuation – when your children don’t open and close the door frequently. Warranty and support: This Kalamera 46-bottle comes with one-year limited warranty by Kalamera. Summary: This Kalamera KRC-46DZB-TGD 24-inch-wide 46-bottle wine cooler (view on Amazon) is one of the most versatile 46-bottle wine coolers in the market. It has an elegant and modern design of stainless steel and triple-layer glass door. It has a reversible door. It is a dual zone – to store both your red and white vintages. It has sliding shelves, digital temperature control, LED light and security lock. This Kalamera 46-bottle is a best-seller on Amazon. If you would like to consider other top Kalamera models, check out our featured list of the best Kalamera wine coolers.